We told you we were making some changes, and the changes even extended to coffee mugs. The ASAP logo,fortunately,works well in single color – and there is quite a story behind how the logo came into being (it involves Houston artist John Palmer and Dr. Dickens – we’ll tell you about it sometime). 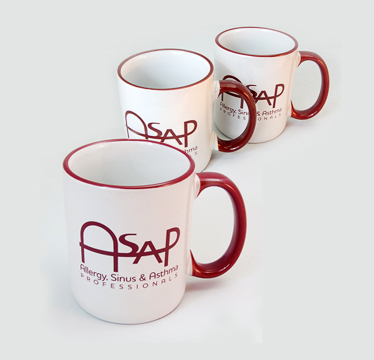 Meanwhile, the mugs represent just another, small, indication of our commitment to excellence in every detail of in our medical practice, our work, our patient relationships, and our worker and patient environment. As noted in a prior post, we are preparing for a year of enhanced and expanded services at ASAP — and we look forward to announcing them soon. Share the post "ASAP Mug Shots!" This item filed under ASAP Environment, ASAP News, John Palmer. | Bookmark this page.